With more than 87,000 nozzles from which to choose, we have the most extensive line available. Choose from Full Jet® full cone nozzles, clog-resistant maximum free passage Full Jet nozzles. If you need a flat spray nozzle, Vee Jet®, Flat Jet® and Flood Jet® nozzles are popular selections. Hollow cone spray nozzle options include our Whirl Jet®, Hollow Jet® and Spiral Jet® nozzles. We also have a complete line of fine spray nozzles including hydraulic atomizing nozzles. You won’t find more sizes, capacities, materials or connection options. The most recent addition to our line is plastic Full Jet nozzles available in Kynar(R) or polypropylene with a PVDF vane. 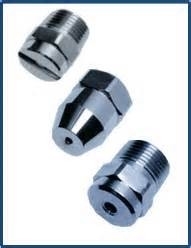 These nozzles offer excellent chemical and corrosion resistance and feature a unique vane design that produces a true and stable pattern and provides superior cleaning. Many of our nozzles are available in versions to facilitate the cleaning and replacement of plugged or worn spray tips. These consist of a nozzle body and spray tip. The spray tips can be removed for cleaning and/or replacement while the nozzle body remains on the pipe or spray header. For high-pressure applications, our Wash Jet nozzles provide superior, high-impact performance. Pressures range from 300 to 4000 psi (20 to 276 bar) and feature spray patterns ranging from 0° to 80°. These nozzles are suitable for use with a wide range of flow rates and operating conditions and are available with a choice of spray patterns, spray angles and connections.